Your Mama thinks someone is smoking some serious real estate crack in New York City where a phenomenal French Gothic-style townhouse on East 80th Street is about the hit the market, according to the New York Times, with a blistering–and publicity generating–asking price of $90,000,000. That's right, puppies, ninety million clams. The opulent 35-foot wide pile was built in the early 1900s by dime store tycoon Frank Woolworth for one of his three daughters, Jessie, Edna and Helena. Mister Woolworth also built each of his other daughters equally sumptuous mansions on either side of the one that's about the hit the market. The limestone-faced house stands seven stories with more than 18,000 square feet and includes soaring 14-foot ceilings on the parlor floor, 10 bedrooms, 11.5 bathrooms, 3 kitchens, an elevator, a full-width paneled library and a formal dining room that can accommodate 50 for a sit down meal. The townhouse last transferred hands in 1995 when ladies health club entrepreneur Lucille Roberts bought it, according to property records, for $6,000,000. Miz Roberts went to meet The Great Trainer in the Sky in 2003 and the grand mansion is now being sold by her family. 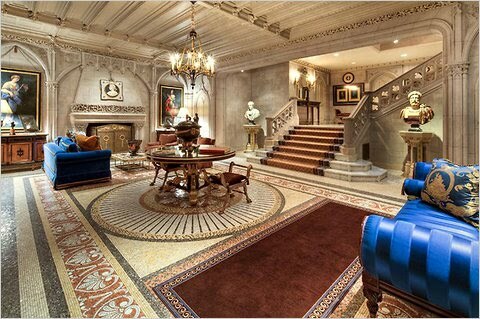 Frank Woolworth, the son of a potato farmer, not only built extravagant homes in New York, he also built Winfield Hall (above), a baronial 62-room Italian Renaissance-style behemoth in ridiculously affluent Glen Cove, NY with 9 bedrooms, 10.5 bathrooms and a pink marble staircase oft said to have two million bucks to build. 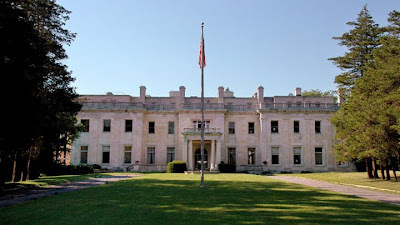 A marvelous cache of photos of the palatial property can be seen here and a fascinating video tour of the vast mansion can be see on the Old Long Island blog. The 16-plus acre estate is currently owned by Martin Carey, the brother of former New York governor Hugh Carey who himself owned a house on Shelter Island that captured the attention of real estate gossips a couple of years ago. Mister Martin has had the property on and off the market a number of times. It was recently on the market with $19,500,000 asking price but was quickly de-listed after a production company leased the property for the filming of a remake of Mildred Pierce starring Kate Winslet, Evan Rachel Wood and Guy Pearce. Speechless about the supposed asking price of the townhouse! So Martin Carey owns Windfield, but obviously doesn't live there OR take very good care of it--the condition of the mansion and the property appear to be in VERY bad shape from the photos. What's the point in owning it if he isn't going to take care of it? Tasty morsel Mama...........this is a perfect antidote to the sad and troubling images of muck and destruction coming out of Japan. The links look juicy and I look forward to them. Winfield prompted me to Google info re Woolworth and Barbara Hutton, et. al. What struck me in reading the info was how far 50 million dollars would go in the 1930s. Barbara who was F W's granddaughter had enough to build Winfield House in London in Regents Park that is now the US Ambassador's residence. And quite a pile it is too. 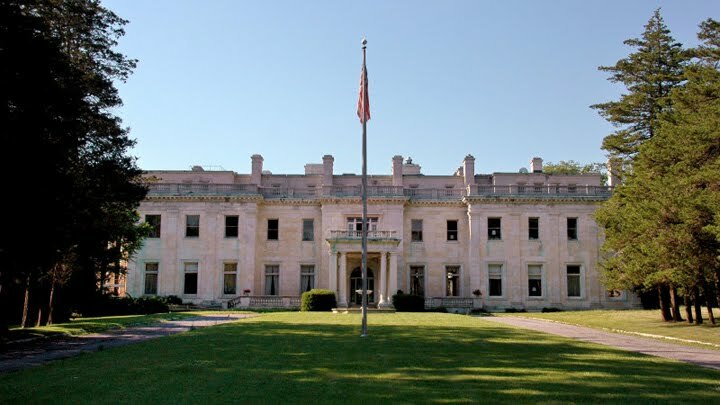 Lots of lore surrounds the Glen Cove estate; the original house belonged to Alexander Humphreys; after Woolworth bought it, it suspiciously burned down (with no loss of life, art, furniture, etc.) The still extant marble palace was built in its place, on the same foundation and completed in approximately 18 months, with crews working 24/7/365, and was apparently done to plans already drawn up before the fire. There's a crypt under the west porch in the dimensions of an Egyptian tomb (Woolworth supposedly secreted a smuggled sarcophagus in there), spy holes in the cornice in the gold-leafed music room (the cornice concealed a catwalk Woolworth used to spy on his guests; apparently the organ in the room caused the gold leaf to rain down upon the guests, prompting him to releaf after every party). Monica Randall's book, is full of interesting, if somewhat questionable, tidbits. There was apparently bad blood between Woolworth & his neighbor to the west, Captain DeLamar, who had the choicer waterfront lot (Woolworth's coal tunnel ran from the shore to Winfield Hall under DeLamar's property). DeLamar sold Pembroke to the Loews family, who made their fortune in movie theaters, and the parties held their are said to be the inspiration for The Great Gatsby. Incidentally, the house believed to be the inspiration for Daisy Buchannan's house, with that iconic white pillared porch, has just been slated for demolition this month; a sad end to an era. how much did the governor's brother pay for it ? ad was it left to the state of new york when he boughtit ? hmmm.. There are not many people in the world who have a spare 90 Million to spend on a house, I bet it lingers on the market with price slash after price slash. If anyone has the desire to "live the life" of Barbara Hutton on her former yacht, you can stay on it in Stockholm, Sweden as it's been turned into a hotel. I stayed there a few years ago--the rooms are very small, but it was a great experience. The name is Malardrottningen Hotel and Restaurant.